A new report “From BPA to BPZ: a toxic soup? How companies switch from a known hazardous chemical to one with similar properties, and how regulators could stop them”, published today by CHEM Trust, highlights how industry is being allowed to replace the well-known hormone disrupting chemical bisphenol A (BPA), with very similar chemicals that may also be harmful. BPA is a chemical that has been used in thermal paper till receipts, polycarbonate water bottles, and food can linings. It’s also a common contaminant of house dust. It was first found to be able to mimic the female hormone in the 1930s and in recent years there has been more and more evidence of its potential impact on health, including increased risk of breast cancer, impaired sperm counts, impacts on diabetes and obesity, and hyperactivity in children. 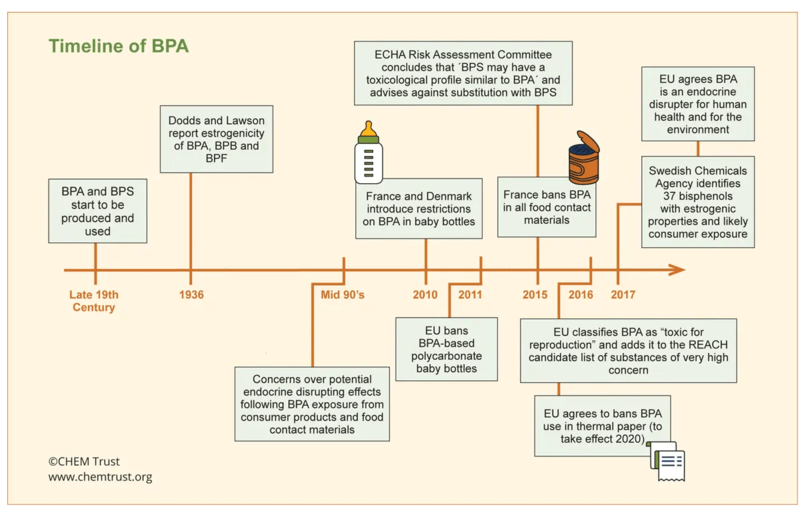 The European Union (EU) has banned BPA’s use in baby bottles, and is phasing it out of till receipts, but it is still extensively used in other products. 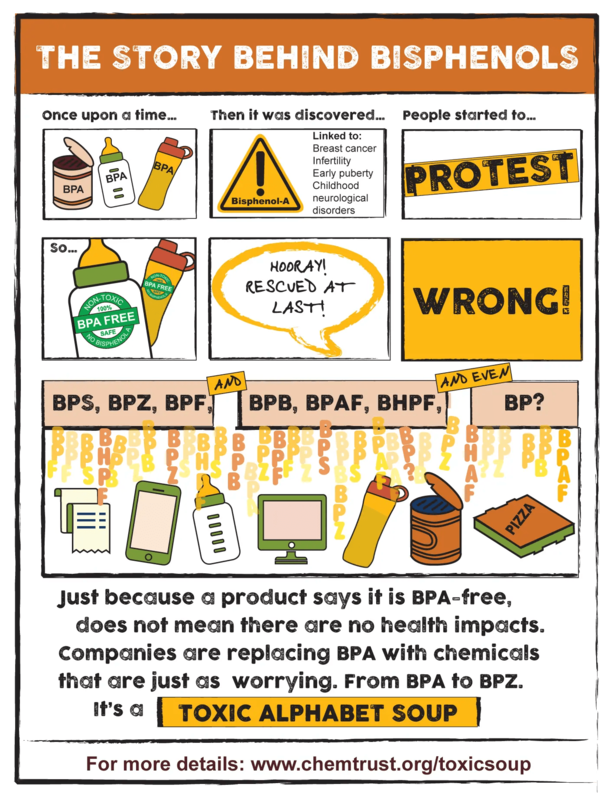 When BPA first came to the public’s attention over two decades ago, manufacturers scrambled to find replacement chemicals to use in products. Many found that the easiest option was to move to another closely-related bisphenol, such as bisphenol S (BPS). Researchers are now finding many of these closely-related chemicals in people around the world – and they are finding that they are also potential hormone disruptors. However, regulators are not yet controlling the use of these similar chemicals. The report also highlights that most companies selling BPS are claiming that it has no hazards. This is even though the European Chemical Agency (ECHA) Risk Assessment Committee (RAC) has said BPS has a “toxicological profile” similar to BPA and should not be used to replace it in products. “This report shows that people and the environment are not being properly protected from hazardous chemicals as businesses are moving from one problem chemical in a group to another. This report is published a year after CHEM Trust’s “No Brainer” study, which reviewed the evidence that a number of chemicals, including BPA and BPS, might harm brain development in children. CHEM Trust has written to three relevant EU authorities, ECHA, the European Food Safety Authority (EFSA), and the European Commission’s Health Commissioner, to ask them to restrict the use of groups of similar chemicals to prevent the substitution of one hazardous chemical with related chemicals that have similar properties. The only exception to this should be if industry has good data showing the chemical they wish to use does not have the same properties as those of the chemical being restricted. ECHA has started investigating BPS, but is asking industry for more safety data rather than regulating its use. As far as CHEM Trust is aware EFSA, responsible for assessing chemicals in food packaging, has not re-examined the toxicity of BPS or other bisphenols. Regulators should regulate groups of related chemicals, rather than taking a substance by substance approach. Chemical companies must improve their own assessment of the safety of chemicals. Downstream users of chemicals should not replace one problem chemical with another similar chemical from the same group. Consumers should ask retailers whether products such as plastic bottles, till receipts and food cans are bisphenol-free. We also recommend that EU regulations on chemical safety are still the best way to address this issue, and that the UK should be aiming to stay in this regulatory system. See our chemicals and Brexit page for more details. Material about the report is also available in French, Dutch and Spanish. The report has been covered by Chemical Watch, ENDS Report, Food Navigator.com, Product Safety News, The Ecologist, CIEL, Chemsec and Libres de Contaminantes Hormonales. Previous post: UK confirms it would like to remain in EU chemicals law REACH, but will it meet the EU’s conditions?